Sometimes dreams do come true. My very close friend Tonya found her prince, Ted, and they were set to marry the weekend of Cinco de Mayo. I was flattered when she asked me to do not only her wedding make-up but also her hair. Wait… yikes! You want me to do your hair?? 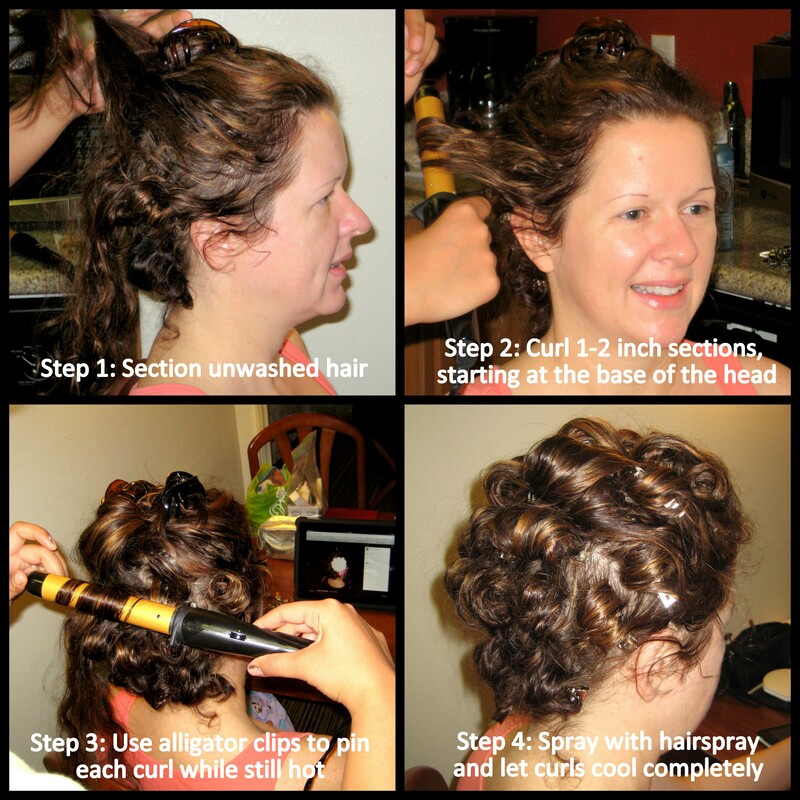 Um, sure I do my own hair for events plenty, but I haven’t done a lot of updos on other people’s heads. However, Tonya has naturally curly hair, which I knew would make the updoing a lot easier. I told her she could count on me. A few weeks before, Tonya came over for a run-through so we’d have a game plan the morning of the big day. We had already been pinning hair and make-up inspirations on Pinterest for months, so we had good starting points. 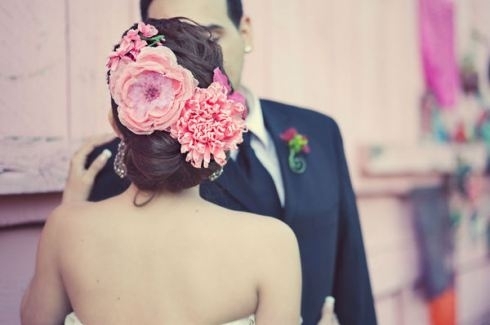 Tonya and Ted’s wedding was Mexican-themed, and she wanted to wear big, colorful flowers in her hair. For the make-up, we would go classic but bold enough for the photographs. 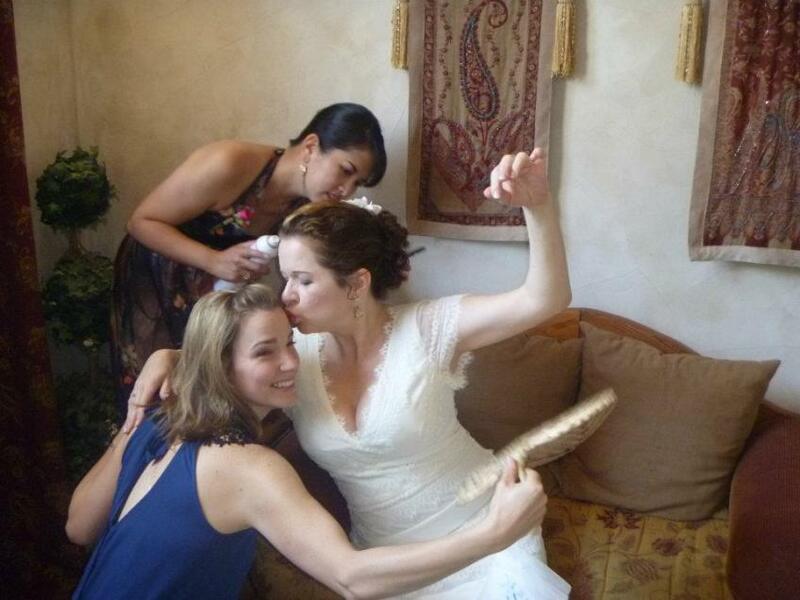 The day of the wedding, we woke up a little after 8am. The ceremony start time was 1pm, and our target time of departure from the hotel was 11am. We ate breakfast and lingered a while, so hair setting didn’t start till just after 9am. We probably should have got going earlier, because it was a mad rush to the finish. Setting Tonya’s hair took about 35 minutes. Next task was make-up, and I referenced photos on her iPad that I took the night we did the run-through. I must give credit to the bride, because Tonya did a good amount of the work herself, applying her own primer and foundation, eyebrows and lips, coming over to me periodically for quality checks. We stayed with neutral shades for her eyes – always a good call so you don’t look back in 20 years and regret that blue eyeshadow you wore on your wedding day. We did try false eyelashes on one eye and decided it was too much. Somehow I had forgot to put individual false lashes on my packing list! Shame on me. 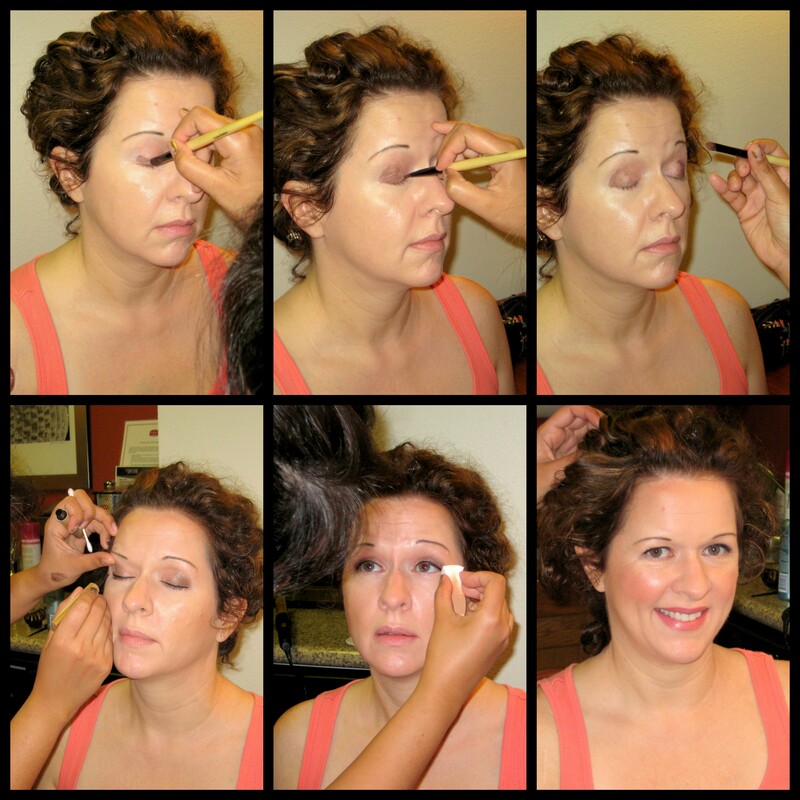 Tonya has very fair skin, so we made the bride blush with non-shimmery bronzer and a bright coral on her cheeks. Lips were rosy pink and shiny. Tonya looked stunning! Remember how I said we were supposed to leave at 11am? Well, I didn’t even start pulling the pins out of her curls until 10:38am. Ack! Definitely would have liked more time, but I put up her hair at record speeds, and we were out the door at 11:10am. Final touch-ups (including finishing my own make-up and doing my hair) happened onsite. The most rewarding part of doing a friend’s wedding day make-up is seeing the look on the groom’s face the first time he sees his bride. Pure joy. 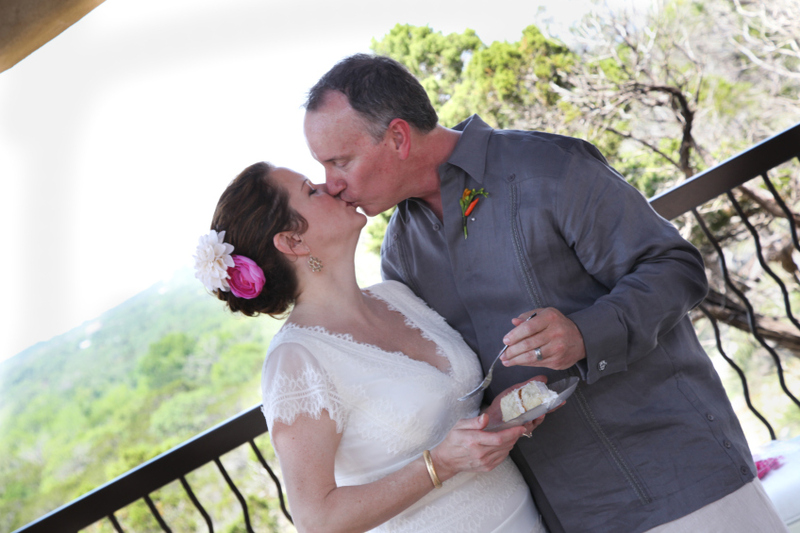 With the picturesque Austin hill country as the backdrop, the ceremony was so beautiful and perfect. I’ve known Tonya for about a dozen years now, and I’ve never seen her happier. I love this couple with all my heart, and I’m so honored to have been part of their special day. Congrats to the newlyweds! This entry was posted in Vanity and tagged Anastasia, Bare Escentuals, Benefit, blushing bride, Bobbi Brown, Cinco de Mayo, Clinique, Dior, hair updo, L'Oreal, make-up, setting hair, Stila, wedding on June 11, 2012 by jenn. Wow Jenn, I am so impressed!